The exotic and somewhat mysterious Siamese cat hails from the country of Thailand. They had always been a popular breed of cats, some even residing in royal palaces. Siamese cats, in the past, were trusted to protect royal palaces and monasteries from evil spirits. These cats were also thought of as bringing good fortune to their owners as well. During the year of 1884, the very first Siamese cats began to make their way to England, when they were given as gifts to a British general. After that, they eventually made their way over to America. Now days, Siamese cats are one of the most recognized of the breed. Siamese cats are without a doubt the most popular short haired cat and among the top 3 in the entire breed of cats. 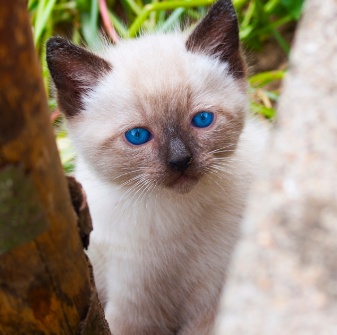 Even though there are several different colors to this breed, some questions what makes a cat a true Siamese cat. These cats have always been known for their bodies which are lighter in color, with darker areas throughout. The more darker areas found on their bodies are normally around the feet, tail, legs, or face. They can weight anywhere between 6 - 16 lbs, with bright eyes that are normally slanted - which is another clue that the cat is a true Siamese. Traditionally, Siamese cats are robust, with round heads and a truly muscular build. They are well known throughout the world for their color points and unique personalities. Unlike other breeds, Siamese breeds have a talent for communicating with people. If you are looking for a cat that is nice and quiet, you wouldn’t want a Siamese cat. These cats love to play, love to make noise, and they also happen to be the most social breed of cats out there. Siamese cats demand a lot of attention, because in their minds, they believe that the world revolves around them. For this very reason, they can tend be quite dependant on their owners. They love to play, and crave interaction. If you leave them alone for too long, they won’t like it. They like to get attention, love to play, and hate to be left by themselves. Even though Siamese cats are emotionally high maintenance, they don’t need a lot of maintenance They need a minimum amount of grooming, which involves bathing every once in a while, and brushing maybe once or twice a month. If you like cats with minimal maintenance, Siamese cats are perfect. Their hair is short to their skin, so a gentle brushing is all you need. They can get sick however, which is to be expected with any breed of cat. Siamese cats have a life span that is similar to other breeds, which is normally around 15 - 20 years, sometimes even longer. As long as you feed him on a daily basis and take him to the vet for his regular checkups and shots, he will be around for years and years to come. Most people who have their Siamese cat for over 10 years, find the cat to be more like a child than a pet. No matter how you look at it, a Siamese cat is a great pet. Although the Siamese breed does require a lot of attention, they are excellent pets that you can spend a lot of time with. They are great for kids as well, simply because kids can spend a lot of time with them. As long as you give your pet the attention he craves - he will be your life long friend for as long as you have him. 0 Response to "An In Depth Look At Siamese Cats"